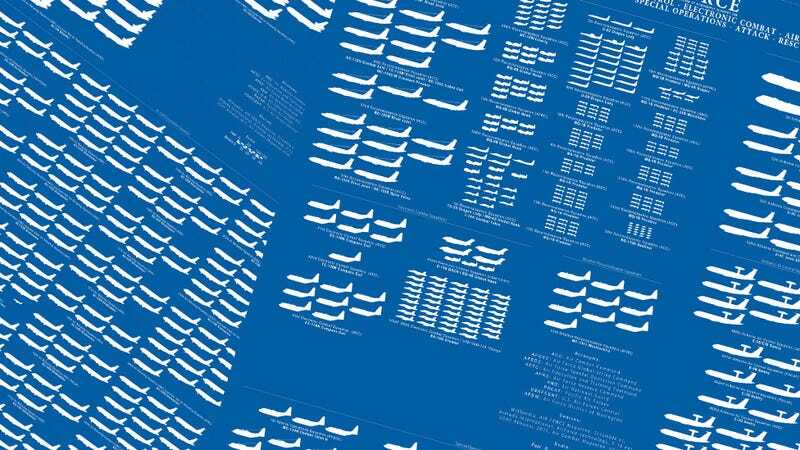 The folks over at Contemporary Issues and Geography have done an amazing job at creating highly detailed inventory charts of different air arms, and they are currently knee-deep detailing the USAF’s entire force structure. They have already released the Air Force’s fighter inventory graphic, and now they have released two more. The first of these new graphics show the highly diverse hodgepodge of information, surveillance and reconnaissance assets, along with electronic warfare, special operations and combat search and rescue aircraft. The second graphic is a little less diverse but gives us a good visual as to the size and makeup of the USAF’s aerial refueling fleet. You can download full resolution versions of both these awesome graphics here and here. Our friends over at Contemporary Issues and Geography have also released a US Navy version, a USMC version, a USCG version and Raytheon has provided a U.S. Navy ships version. CISG will be tackling the rest of the USAF’s inventory one category at a time. The plan is to have the USAF’s total inventory represented over six charts when the project is finished, at which time they will be combined. Let’s hope for a U.S. Army aviation version soon, and maybe, if we are lucky, some foreign air arm graphics. China in particular would be fascinating to see represented this way. Make sure to check CSIG out at their website. A poster of the Navy version is up for sale now.